Conservative environment minister Owen Paterson has declared that the UK has to move forward and become a world leader in the production and research of GM crops. For those of you who don't know, the UK has remained quite GM free - there are no GM crops produced commercially and research has been limited. In greater Europe, the EU has put roadblocks on GM that have held the technology somewhat at bay, only approving two GM crops for commercial use. Paterson is correct that, in terms of direct health from consumption of crops, GM has no particular reason to be inherently unhealthy and there is no evidence to suggest it would be. Pseudoscience hysteria about how scary GM is just isn't productive. However, our health is not merely a function of what we eat but also of what surrounds us. Crops like RR canola - which works by dousing massive areas in RoundUp glyphosate herbicide - may be healthy to eat strictly speaking, but also involve a huge amount of production of herbicide, shipping of herbicide, distribution of herbicide, and deployment of herbicide that would otherwise not be necessary. Glyphosate is not a particularly harmful chemical compared to others out there, but when you add up all the layers of logistics and manufacturing to get it to the field, we are not talking a light impact here. From a different angle, bt corn is engineered to express the bt toxin, which is poisonous to pests and the plants expressing it are believed to be safe to humans. However, there is concern (and unclear evidence) as to what the effect on greater insect populations is. I don't think that "what if" is always a good enough reason to stop science or progress, but deployment of insecticide over a mass scale is something that we do not completely understand and the possible risks to our food supply are too great to not be conservative. Another concern is the loss of biodiversity in food crops. It could take just one virus to wipe out much of the world's wheat supply, for example, and limiting more and more crops to monocultures is a very risky strategy when we can already barely feed ourselves. This is already a risk, however, with modern agriculture, so it's hard to say if GM worsens that situation or if it's of similar risk. So the science side of it is mixed. Compared to standard, modern industrial agriculture, it's hard to get too worked up about GM. But what about the side that affects society? Well that's the big issue here. Currently, GM technologies are controlled by a small group of companies - the ones who are rich enough to invest in research and creation of these plants. The privatization of our food supplies and aggregation of ownership into these few hands in deep pockets is deeply troubling. For example, traditional collection of seed is limited, since most of these plants cannot reproduce sexually themselves reliably. That means that farmers have to buy seed year after year. This won't affect first world commercial farmers so much, but in the third world? Absolutely. 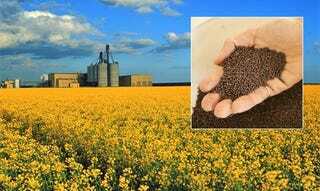 For certain crops (like RR canola) there is also a heavy investment in herbicides required - herbicides produced by the same companies that produce the GM seed. Do we see a conflict of interest here? Basically, GM crops are probably generally no worse to eat than any other commercial crop, but we know from the banking crisis that concentrating more and more power into corporations that exist (quite rightly) for the sole purpose of making money is not the best way to manage the systems that keep us functioning. So, Owen Paterson, no, let's be the leaders in finding new ways to manage our food systems and increase productivity.